Cannot have attachments. Forced: After a treachery card with the Sorcery trait is revealed from the encounter deck, Thaurdir makes an immediate attack against the first player. Cannot have attachments. Each other enemy gets -10 engagement cost. 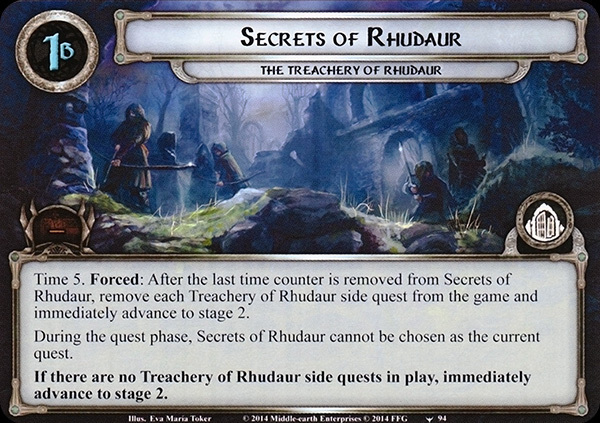 Forced: After Thaurdir is flipped or a treachery with the Sorcery trait is revealed, Thaurdir heals 3 damage and makes an immediate attack against the first player. Forced: When Orc of Thaurdir attacks you, either discard the top 2 cards of your captured deck, or deal Orc of Thaurdir 2 additional shadow cards. Shadow: For each damage dealt by this attack, discard the top card of your captured deck. Forced: After Thaurdir's Damned engages you, discard the top 2 cards of your deck and assign X damage among characters you control. X is the combined printed cost of the discarded cards. Forced: When Thaurdir's Hunter attacks, either remove 1 time counter from the main quest, or treat this attack as undefended. Shadow: If this attack is undefended, either remove 1 time counter or 5 progress from a quest. 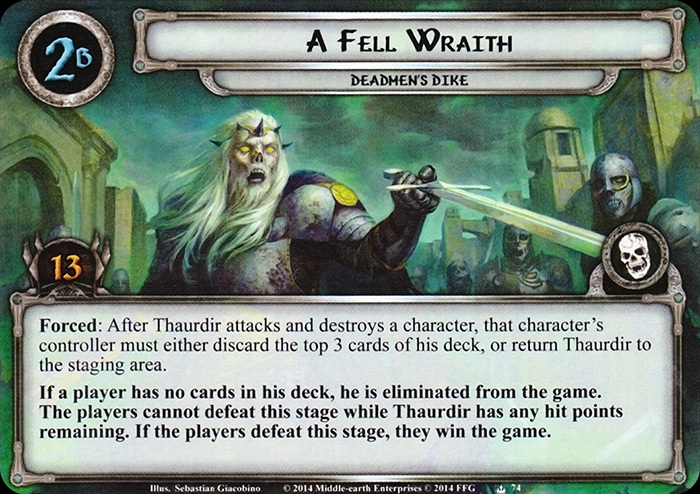 Forced: If there are 3 shadow cards dealt to Thaurdir's Elite, discard all shadow cards dealt to it and each player must discard an ally he controls. Shadow: Either raise your threat by 4, or discard an ally you control. When Revealed: Add Thaurdir to the staging area. Then, reveal 1 encounter card per player. 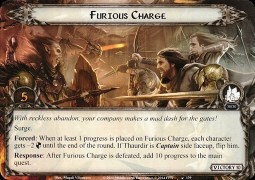 Forced: After Thaurdir attacks and destroys a character, that character's controller must either discard the top 3 cards of his deck, or return Thaurdir to the staging area. If a player has no cards in his deck, he is eliminated from the game. The players cannot defeat this stage while Thaurdir has any hit points remaining. If the players defeat this stage, they win the game. Setup: Put Iârion into play. Set Thaurdir aside, out of play. Add 1 copy of Fornost square to the staging area. Shuffle the encounter deck. 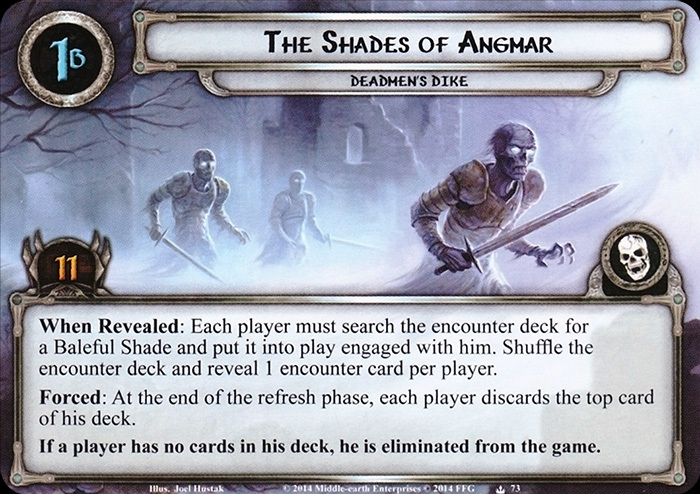 When Revealed: Each player must search the encounter deck for a Baleful Shade and put it into play engaged with him. Shuffle the encounter deck and reveal 1 encounter card per player. Forced: At the end of the refresh phase, each player discards the top card of his deck. If a player has no cards in his deck, he is eliminated from the game. You are playing Nightmare mode. Forced: After choosing a starting hero and randomly setting another hero aside facedown, instead of the standard captured deck setup, shuffle any remaining heroes into your captured deck, then place the facedown set aside hero on the bottom of your captured deck. 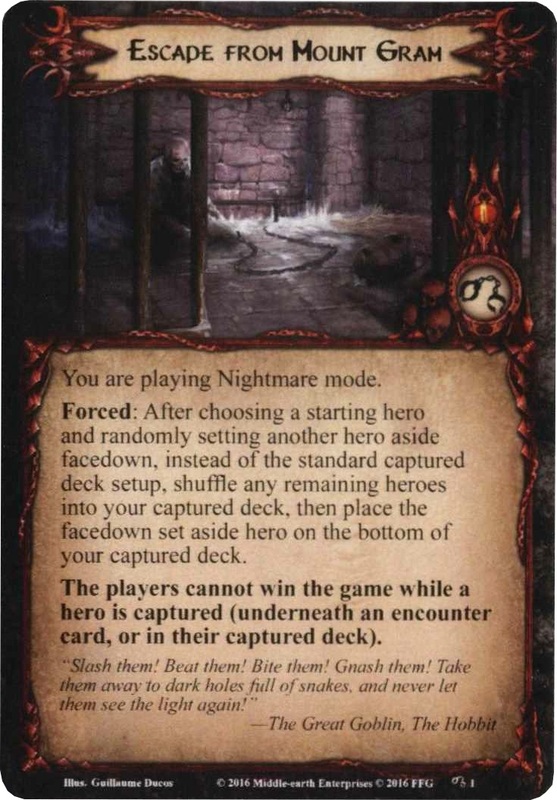 The players cannot win the game while a hero is captured (underneath an encounter card, or in their captured deck). Begin with the standard quest deck and encounter deck for the Escape from Mount Gram scenario. 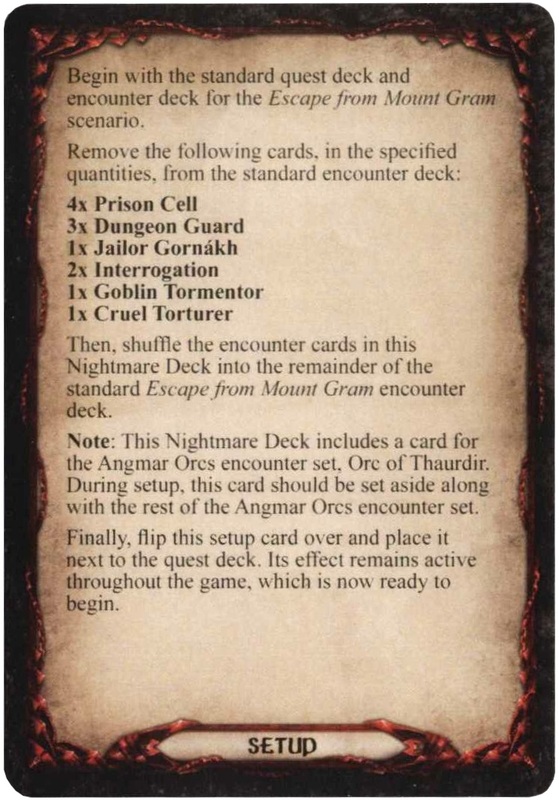 Remove the following cards, in the specified quantities, from the standard encounter deck: 4x Prison Cell 3x Dungeon Guard 1x Jailor Gornákh 2x Interrogation 1x Goblin Tormentor 1x Cruel Torturer Then, shuffle the encounter cards in this Nightmare Deck into the remainder of the standard Escape from Mount Gram encounter deck. 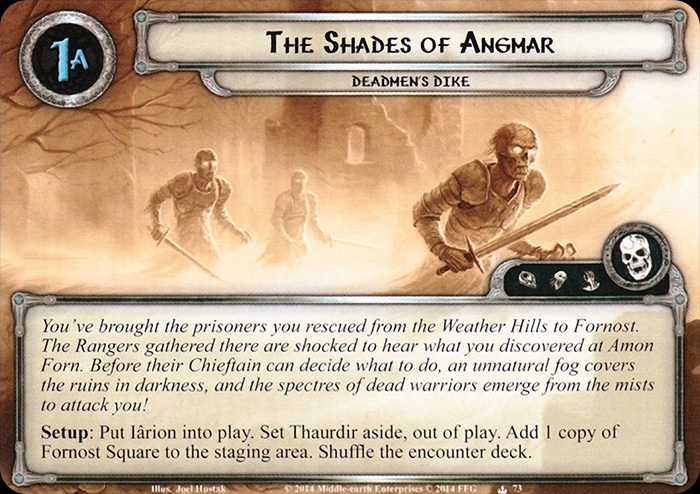 Note: This Nightmare Deck includes a card for the Angmar Orcs encounter set, Orc of Thaurdir. 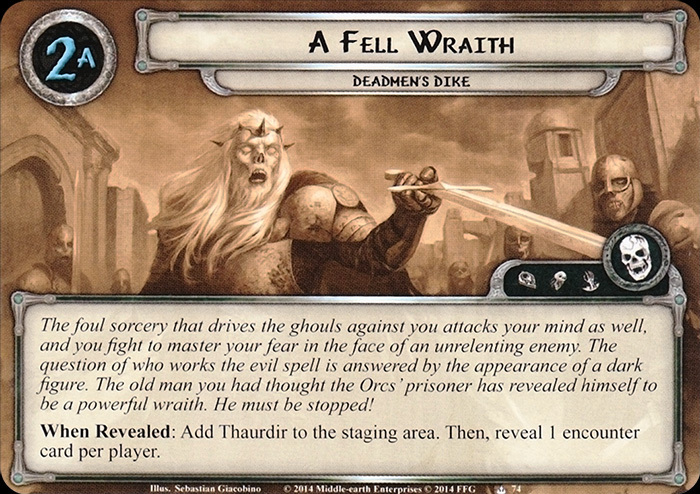 During setup, this card should be set aside along with the rest of the Angmar Orcs encounter set. Finally, flip this setup card over and place it next to the quest deck. Its effect remains active throughout the game, which is now ready to begin. While you are engaged with Apostate of Angmar, you cannot attack Thaurdir. Shadow: Discard the top card of the encounter deck. Attacking enemy gets +X Attack, where X is that card's printed threat. When Revealed: Deal Life Drain to Thaurdir, as a shadow card. 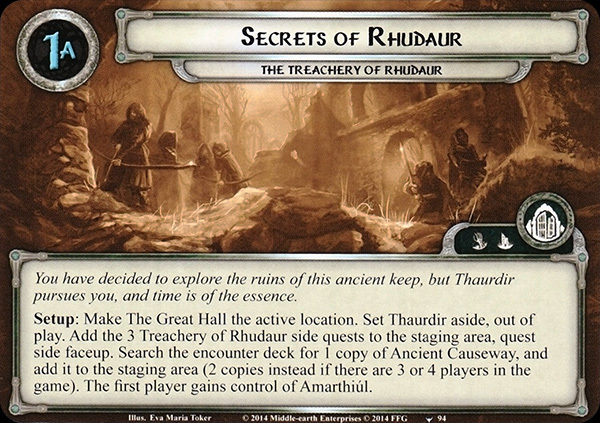 Shadow: Attach Black Mare to Thaurdir. Thaurdir gets +2 Threat, +2 Attack, and cannot take damage.